The March sisters get thrust into the modern age, complete with hammy idioms and an undercooked examination of contemporary womanhood. What would the world of the March sisters look like in the contemporary era? Such is the concept behind Clare Niederpruem’s misguided take on Louisa May Alcott’s classic novel “Little Women.” Released between last year’s well-received three-episode PBS miniseries and Greta Gerwig’s upcoming star-studded feature, Niederpruem’s debut will be remembered as a curiosity amongst otherwise stellar adaptations. Niederpruem, who adapted the book with Kristi Shimek, clearly has great affection for Alcott’s indelible sisters, but her film never goes beyond placing them in a contemporary setting and simply hoping for the best. It’s clear that Niederpruem and Shimek approached their subjects with a great deal of admiration, though that doesn’t always translate into understanding the women who drive Alcott’s narrative. Like most adaptations of “Little Women,” this one is predominantly focused on Jo (played in her older years by Sarah Davenport); here, she attempts to make it as a writer of a “high fantasy mythopoetic fable” in New York City. Back home in Massachusetts, her various sisters carry on with their own lives, and the film’s screenplay weaves together their past and present to offer a truncated look at the sisters and their bonds. Undercutting the storytelling is Niederpruem’s decision to cast two sets of sisters for the sisters’ different ages, and then almost immediately split them up into disparate groups. Jo and eldest sister Meg (played later by Melanie Stone) age up, while Amy stays her younger self for far too many years. The result: No one ever looks the appropriate age and it’s occasionally difficult to understand where certain scenes fall on what should be a simple timeline. Still, the film is at its best when focused on the sisters, showing off their different dreams and personalities. It’s Jo’s dreams that push her into a meek existence in NYC, as she attempts to hawk her book and comes into contact with handsome professor Freddy Bhaer (Ian Bohen). Jo’s massive novel was inspired by her early years with her sisters, steeped in a combination of creativity and boredom, and while her excitement for the material is contagious, her ambition remains wildly outsized. Davenport, tasked with playing Jo from a young teenager to a grown woman, captures Jo’s impetuousness, but the result is a flighty, selfish take on the March sister that’s hard to root for. 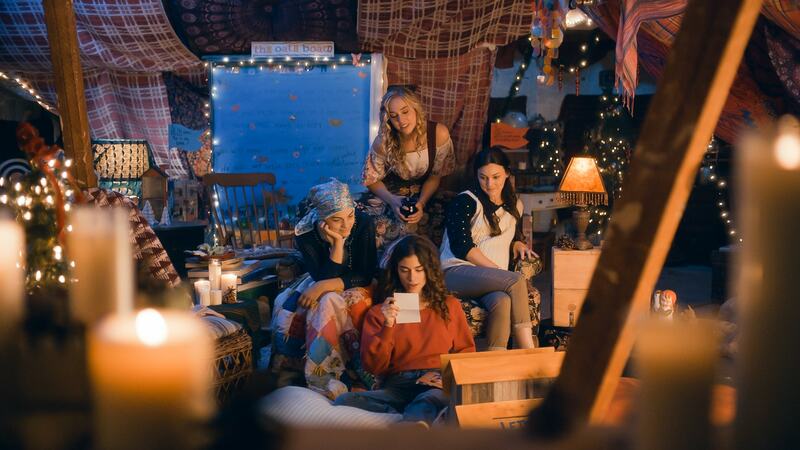 Her more sensitive sisters, including Meg and Beth (Allie Jennings), get significantly less screen time, but still make off with much of the film’s emotion. And it’s Amy (played first by Elise Jones, later by Taylor Murphy) who steals the show, with Jones turning in the rare Amy performance that gives her spoiled brat act actual depth. Inevitably, most of Amy’s spectacular freakouts center on her jealousy over the close friendship between Jo and neighbor Laurie (a terribly miscast Lucas Grabeel). If Niederpruem’s casting decisions can be deemed inappropriate simply based on age, her choice to cast the over-30 Grabeel as Laurie is all but catastrophic. Davenport’s frenetic performance makes sense when Jo is a capricious teenager, but Grabeel’s low-key turn as the March family’s devoted friend simply never gels. Even worse, the romantic undertones to his affection for Jo only read as strange, considering the lack of chemistry between Davenport and Grabeel. This is perhaps the only version of “Little Women” where Jo’s eventual rejection of her friend scans as a relief, not a heartbreak. Most damning is that Niederpruem fails to engage with her central, powerful idea. Despite setting “Little Women” in modern times, the film is disinterested in using the new period to explore the bigger questions at the heart of Alcott’s novel. In its own time, “Little Women” wondered how women’s places were changing in a revitalized world, and what it meant to truly let the March sisters forge their own paths. “Little Women” doesn’t do that; instead, it literally dresses itself up in modern garb while failing to ask the modern questions that made its source resonate. Pinnacle Peak Entertainment will release “Little Women” on Friday, September 28.